William Gilmore Simms refused to act like an old man. In his last full year of life, he continued working, contributing articles and poems to the newly founded Nineteenth Century magazine; he did not receive pay for his contributions but hoped to help this new organ of Southern culture. Still, he was weary. He admitted he lived only for his children (six of fifteen survived) and grandchildren (three of six were then living). Perhaps his biggest contribution in this period was a prologue written for the opening of the new Charleston Academy of Music. It earned him $55. And all repair, so glorious in her Past! Till Art lets in the glorious Light of Day! Such are Art's beautified toils, and such be ours! And all the world of magic fills our eyes! And lo! the crowds that gather from afar! Friends of the Drama, we appeal to you! And find their noblest ally in the Stage. Clearly, Simms saw the opening of the Academy of Music, which was really a concert hall and theater, as a stepping stone to improving the cultural literacy of the South — a cause he often considered. Particularly in the years following the Civil War, the poet/novelist hoped his fellow Southerners would make something of themselves. Incidentally, in the month that followed, Simms was surprisingly open in discussing his ailments. 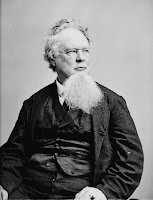 In a letter to his friend and fellow Southern author Paul Hamilton Hayne, Simms admitted to having: "Dyspepsia, in its most aggravated forms, Indigestion, Constipation, Nausea, frequent vomitings, occasional vertigo, and, as a safety valve to this, hemorrhoids." He died about six months later. The Charleston Academy of Music honored him with a tribute eight years to the month after his opening address was presented.